While many Canadian sawmills have reduced production levels due to the economic downturn and low demand for wood products, Domtar’s Elk Lake Sawmill in the small town of Elk Lake, Ont. has been operating on three shifts. That has been keeping Benoit Beausoleil busy. As the woodlands manager for the mill, the transplanted Quebecer has been piecing together a fibre supply plan that will ensure the facility doesn’t go hungry for logs any time soon. But for Beausoleil, dealing with the mill’s fibre supply is all in a day’s work, even if that means most days begin prior to the sun coming up and end after sunset. In total, Beausoleil and Martin Jean, who is the mill’s woodlands supervisor, ensure 500,000 cubic metres of softwood logs cross the mill’s scale annually. This is combined with another 250,000 cubic metres that is supplied by Liskeard Lumber, which is Domtar’s one-third partner in the mill. Beausoleil and Jean also coordinate another 100,000 cubic metres of hardwood annually, which is delivered to the nearby Georgia Pacific oriented strand board (OSB) plant (formerly Grant Forest Products) in Englehart, Ont. and True North Hardwood Plywood in Cochrane, Ont., which is a joint venture between Kruger Inc. and Norbord Inc.
Beausoleil is no stranger to the ups and downs of the fibre supply business. He worked for Domtar for 15 years, handling wood supply at the company’s Val-D’or, Que. sawmill operation for 11 years and then at Domtar’s Grand-Remous, Que. sawmill for four years. He left Domtar to accept a position with Louisiana Pacific’s St. Michel des Saints OSB plant and sawmill in Quebec before heading to Siberia on a contract with Montreal-based KSH Solutions Inc. He then took on the role of director general of a wood syndicate group in Montreal before returning to Domtar almost a year ago when he accepted the Elk Lake position. In his latest role, Beausoleil says he can focus on the fibre supply and operational side of the business as all of the planning and silviculture functions in the Timiskaming forest are handled by First Resource Management Group Inc. (FRMG), which is a private forest management company and agent for Abitibi River Forest Management Inc. and the Timiskaming Forest Alliance Inc. (TFAI). On behalf of TFAI members (the Shareholders, including Domtar), FRMG assumes forest management responsibilities for the forests within the 10,000 square kilometre Timiskaming Forest, which was previously knows as the Kirkland Lake Administrative District. The Timiskaming Forest extends westward from the Ontario/Quebec border for 166 kilometres, and northward from Lake Timiskaming to Lake Abitibi. TFAI is a consortium of forest industries, ranging from small independent logging operators to large forest products producers. In exchange for surrendering of their individual historical harvesting licenses, shares in this forest management cooperative were proportionally allocated and issued to six forest products producers and 12 independent logging operators. A number of acquisitions and share transfers have occurred since incorporation. “It’s a unique system that works well for us,” Beausoleil explains. In addition to working with TFAI, having good contractors in place has also helped Domtar’s Elk Lake mill and Beausoleil stay ahead of the game. He works closely with Henry Fiset and Sons Ltd. in Elk Lake, Rosko Forestry in Kirkland Lake, Ont., Caron Equipment in Timmins, Ont., and two smaller First Nations contractors from the local area – Wincikaby Logging and Heritage Logging, which is a horse logging operation. The Fisets run a tree length stump to dump operation and operate year round except for Spring break-up, which is when Jerome says they bring most of their equipment into the company’s 7,000 square ft. shop in Elk Lake for everything from oil changes to major overhauls. Jerome says most years, the company has about 25 people on payroll, but he adds that when you factor in subcontractors, they keep closer to 40 people working. 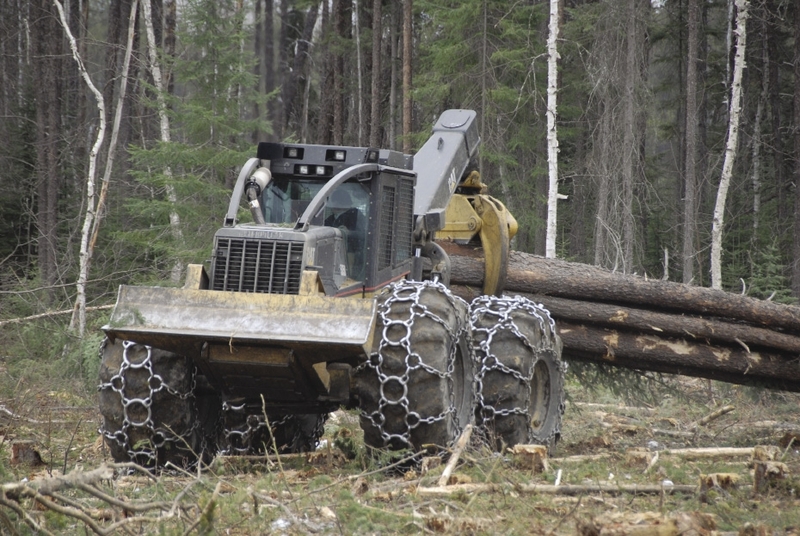 He says most of their logging is for Domtar’s Elk Lake operation, although he notes that with the TFAI in place, sometimes the wood goes to other mills. For the most part, the Fisets run five sorts, three for conifer and two for hardwood. On the conifer side, the sorts are strictly for species – Jack pine, spruce and balsam, while on the hardwood side, one sort is for 14 ft. logs for the Georgia Pacific Englehart OSB mill, while the second sort is for peelers that are mostly sent to True North Hardwood Plywood. The Fisets run a bunching and skidding show with roadside delimbers. In total, they have four feller bunchers, including three Timberjack 900 models and a 2009 John Deere 953 they picked up last year. All of the bunchers are equipped with standard Waratah heads that can handle a maximum tree diameter of 18-inches in one cut. “Anything larger requires two passes,” adds Jerome. For skidding, it’s all Cat with three 535 models, all equipped with the stock grapple. Delimbing is handled by a John Deere 2154 and an older John Deere 230. Both have Denis stroke delimbing heads. Trucking is taken care of with four Kenworth tree length trucks. At the other end of the volume scale, Beausoleil works with Heritage Logging, a First Nations-owned horse logging operation that delivers approximately 1,000 cubic metres per month of much needed cut-to-length(CTL) wood to the Domtar Elk Lake mill. “We have been working with Domtar for about the last five years,” says Jim Bruce, the operations manager at Heritage, who is also knows as “Dad” to the company’s brother and sister ownership team of Jim Bruce Jr. and Carolynne Windich. The company has three working horses of its own – Jack, Jenna, and Stacy, each weighing in at around 2,000 lbs. The other horses that work with Heritage are rented and all of the horses that work at Heritage are Belgian draft horses, with the exception of one Percheron, which is also a breed of draft horse. For Domtar’s Beausoleil, the extra volume of CTL logs delivered by the horse logging operation is very welcome. 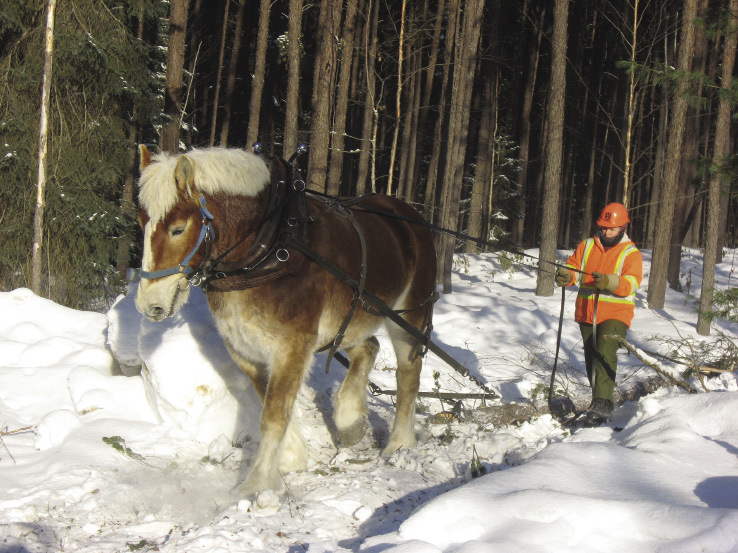 “It only makes up a small part of our volume, but we are happy to have it,” he says adding that they also like the diversity of having a horse logging crew in the mix. Looking forward, Beausoleil doesn’t see any slowdown in production at the Elk Lake sawmill, especially with the lumber prices on the rise and things looking up for Canada’s lumber producers. So for now, to keep the logs flowing he will have to continue to source wood from traditional and non-traditional sources. A challenge? “Yes,” he says. But it’s all in a day’s work.